Installation fast and without works. Motor: 0.25 kW, 300 W at 24 V DC. Speed: 0.10 m / s (+/- 10%). Maximum gradient: 24 to 56 °. Supply voltage: 220 V single phase. Operating voltage: 24 V (safety voltage). Operation: 2 batteries of 12 V 7 Ah. Battery charger: 28 V DC, 35 VA. Payload: 120 kg for a slope of 56 °. Color chair frame: RAL 9001. Upholstery: wide range of colors. My staircase is narrow and curvy. Can I install a stairlift? There are narrow stairs, steep stairs, curved stairs, spiral staircases … Every staircase is different. For this reason, enier stairlifts are manufactured in a personalized way can be adapted without problems itself to any type of ladder. Often there will be several solutions for the same ladder. If you want to be sure which is the best option for your case, ask advice and we will gladly inform you without any commitment. Is the installation of a stairlift will greatly reduce the useful space of my ladder? No. The rail is separated only a few centimeters from the wall so the free passage of the ladder will be almost the same. Also, when you are not using the chair, it must be parked in the loading dock with arms folded seat and thus occupying less space. 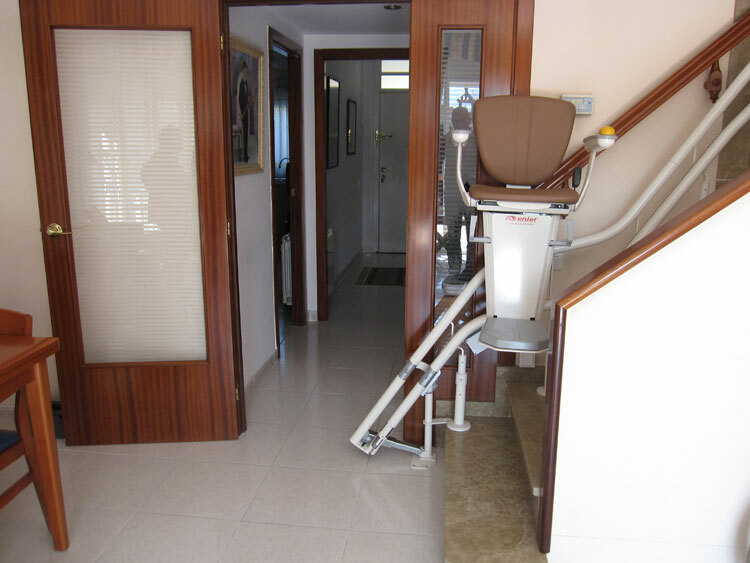 ¿Will fit the stairlift enier with the design of my house? Yes. 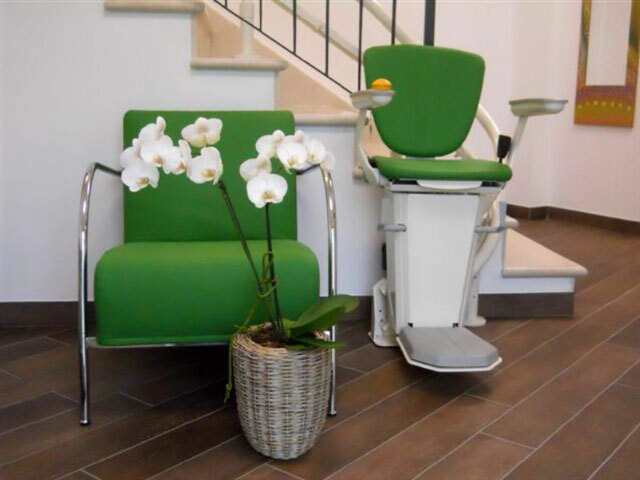 Enier stairlifts are discrete and can choose the color of the rail and upholstery in a wide range of colore. Also, if the staircase is very steep, you can use the rail as handrail. Can I install a stairlift outside the building? Yes. 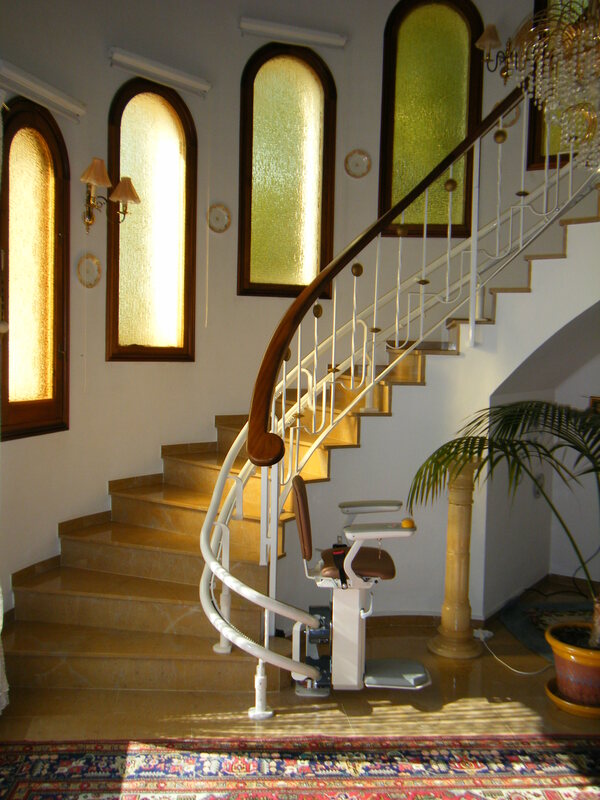 There are models of stairlifts enier that can be installed on the outside. What kind of traction use the chairs salvaescalers enier? Traction is, pinion-rack ensures optimum driving force and perfect grip of the chair rail. At the bottom of my stairs there is a door or hallway. How I can keep the free passage? There is the option that the bottom rail can be lowered. When the chair is not used it can be folded down so that there is nothing obstructing the passage at the door or hallway. Should I ask permission works or works? No, the rail of the stairlift enier is designed to measure the existing staircase and fixed on the steps. No structural changes are required, so no need to request permission. There are small children at home. Does the stairlift is a danger to them? No. The chair has assured that prevent all kinds of entrapment. You can even install a key switch on the armrest and keypads to block its use. should only worry about cleaning the rail regularly with a damp cloth and take care of always leave the chair at the loading point. Any other kind of maintenance is needed? We recommend that our technicians made annually general maintenance of the facility to extend the life of the machine and ensure the smooth operation of all security elements. Do I need a special electrical installation for the stairlift? No. You only need an outlet or plug at the top or bottom of the stairs. Only in very special cases we recommend that a power line is prepared separately with MCB for the chair. What power used to run the stairlift? The stairlift works with the energy it receives rechargeable batteries incorporated and carrying a safety voltage of 24 V. The batteries are charged through the outlet, which is connected to a transformer 230-24 V.
When the batteries are charged and what life have? The batteries are automatically loaded when the machine is at rest at the point of load. A battery can last 3 to 5 years depending on the load cycles and good use made of it. What if there is a fault in the supply of light while I’m using the stairlift? Do not worry, you will. finish the trip and even make several more trips. Just try to leave the chair at the loading point when the power is restored. Depending on the model, the speed varies between 0.10 and 0.15 m / s. In models with curves can configure the speed is slower when going around curves. How much energy consumes a stairlift? Consuming a stairlift is very low, comparable to a small appliance. A lot Noisemaker the stairlift enier? No. 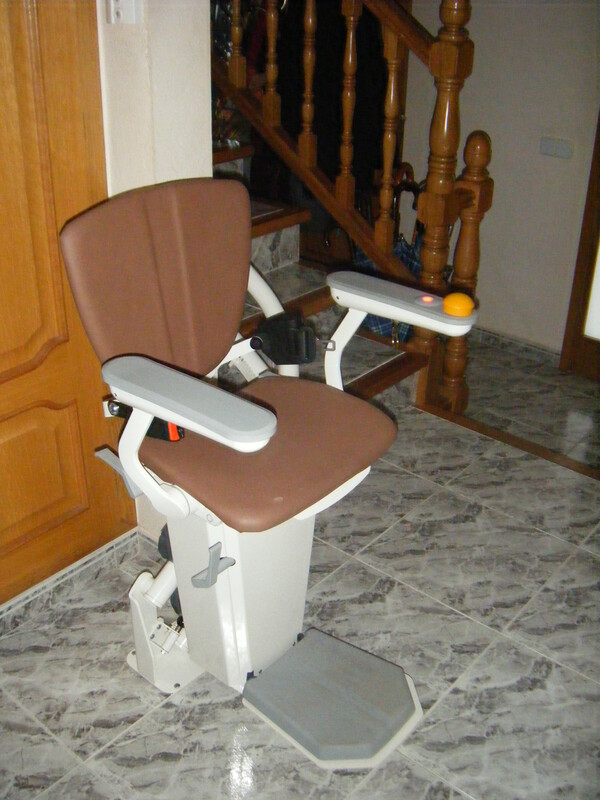 Due to its design, the stairlift enier just makes noise when in operation. You can use it with complete confidence that will not disturb or neighbors or the rest of the family members. Is it easy to use the stairlift? Yes. In fact, enier stairlift is designed and constructed to be easily and safely used by people with mobility problems or elderly. The ergonomic control knob located on the armrest, operate the chair is really simple and intuitive and if, moreover, you still have any doubt, you can always ask us as we will be at your disposal. What is the maximum load capacity of stairlifts? Depending on the type of chair and inclination of the ladder, the maximum load is between 120 and 150 kg. 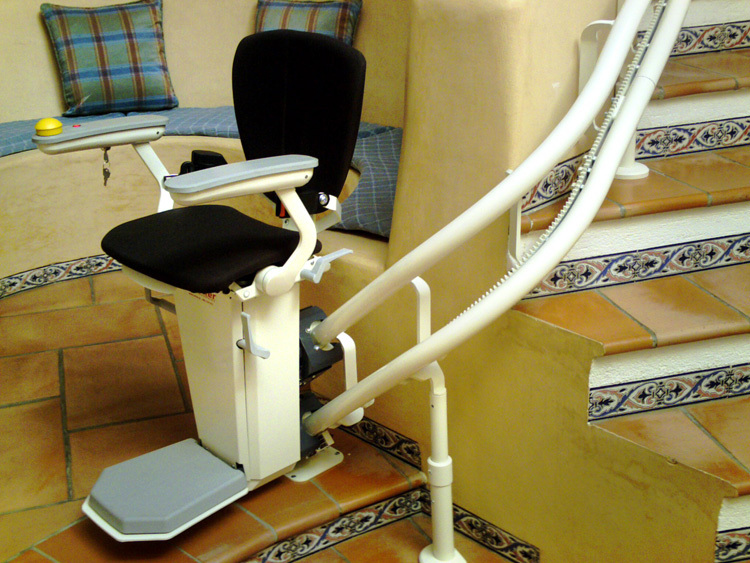 Is there any financial aid or subsidy to purchase a stairlift? Depending on the situation and extent of the applicant’s disability, and local or regional regulations in which he resides, may be wholly or partially funded the purchase and installation of a stairlift. Contact us and we will study your case. 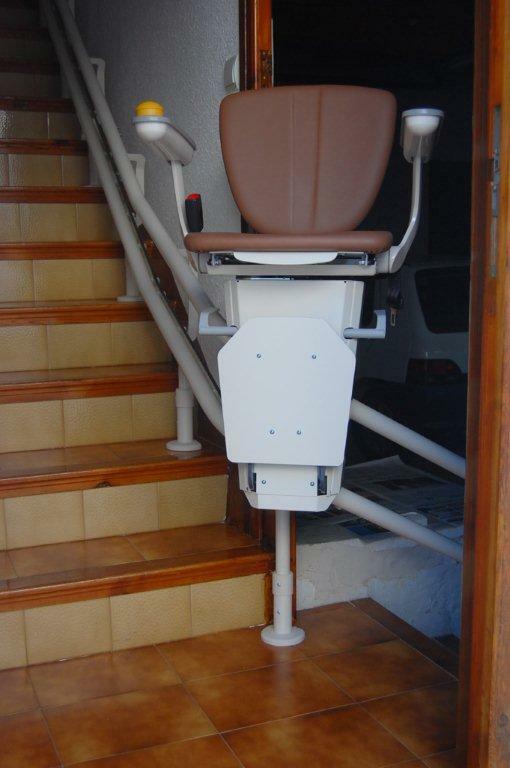 Can I finance my stairlift? Of course. Do not hesitate to ask us about all the possibilities. How much will last the installation of the stairlift? In a few hours the stairlift is installed and ready for use. The ladder remains always clear and usable during the time of installation of the chair. Depending on the model, the delivery is among the possible immediate delivery for chairs with straight up 4/5 weeks chairs with curved sections. What guarantee will my stairlift? The stairlift enier have 2-year warranty to cover defects in parts manufacturing and assembly. Batteries are exempt from warranty. If I have a problem with my stairlift, who will decide? If you have any problems with your enier salvaescaleras, we have an after-sales service that will serve as soon as possible. If I’m interested in a stairlift, how do I apply budget? You should only ask for the information by contacting us by phone or by the form, which, when completed with your data, you must send back to. An agent sales engineer will contact you. To recommend the best solution and will provide a budget without any commitment on your part.